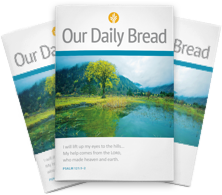 for God’s Word everyday with this daily devotional (free!). books like this to dig deeper and strengthen your faith! a way to share your faith when people ask about your GBC shirt, mug, water bottle, etc. the church lobby or the outside Gazebo to discover more materials that can grow your faith!